Today’s interview is with the team at Sourdough Pizza Company located in Lynchburgh, Virginia. 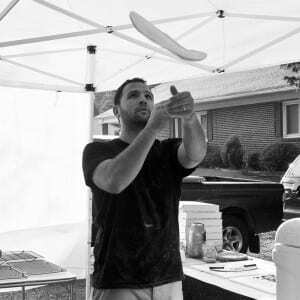 Sourdough Pizza Company is a mobile pizza company that uses a custom built wood-fired oven to create delicious sourdough pizza for consumers and corporate events. The team consists of two couples, Zac and Megan Kolegue and Caleb and Stephanie Atkins. 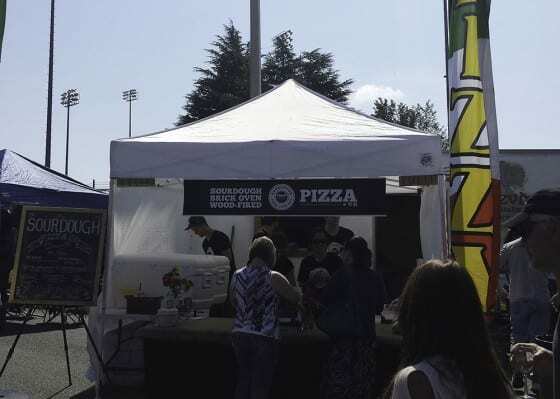 Caleb and team bought a custom vinyl banner from us to use for advertising their wood-fired pizza at farmer’s markets and other events. Founder and visionary, Zac, works as the safety director in Lynchburg for Moore’s electrical. 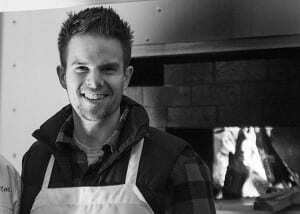 Zac was responsible for engineering and building the oven and hand spins all of the pizzas that are cooked. Zac graduated from Liberty University and played football while attending school. Caleb, also a graduate from Liberty University, is responsible for manning the pizza oven. He currently works full time at Liberty as a video production director. He is responsible for marketing and branding for the Sourdough Pizza Company. 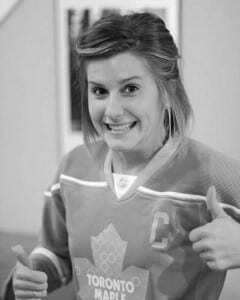 Stephanie, also a Liberty grad (see the common thread? ), is responsible for how the pizza oven front looks. She brings organic, and attractive details to the display and loves to add a personal touch to the design. 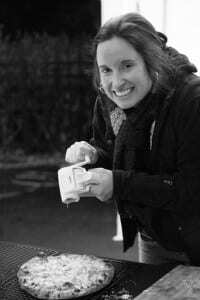 Stephanie currently works as a dental assistant in Lynchburg. 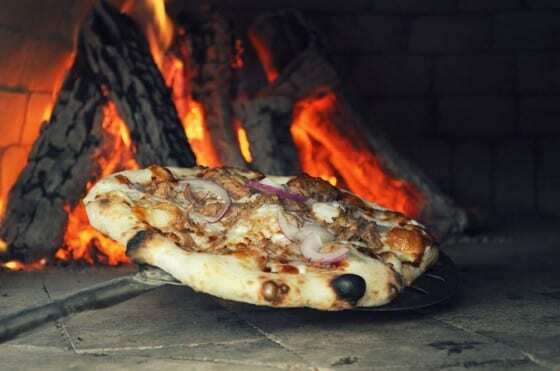 The Sourdough Pizza Company is a mobile, wood-fired, brick oven cooking sourdough pizza! We cater weddings, birthday parties and other special events and have become vendors at various local festivals and markets. The idea for our company came from the West Coast food truck scene. Zac and Megan spent some time in San Diego helping Dave (Megan’s brother) prepare for his wedding. During that time Zac helped Dave cook pizza on his mobile pizza oven and the idea was born. Late in 2012 the idea to build a mobile, brick oven, pizza truck was birthed. Zac and Megan Kolegue shared with their friends, a crazy dream to share great pizza with the world. Fresh off a trip to San Diego, Zac shared his experiences of cooking pizza with his brother-in-law. He was certain that Southwest Virginia would love a new food truck. Thus, the research and planning to build a brick oven began. Fast-forward a year; the oven was built and the first fire was lit. 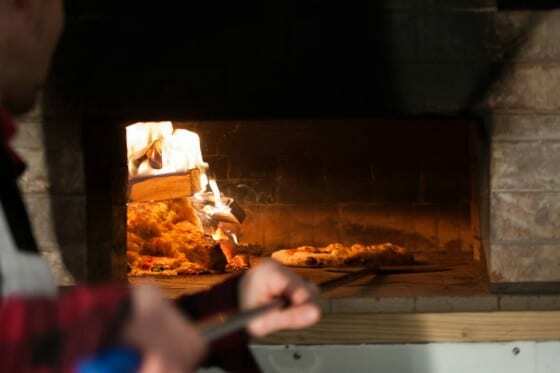 On a cold January day a group of friends huddled around the oven as they celebrated the first wood-fired pizza to come out of the Sourdough Pizza Company’s oven. Our oven is completely DIY. It is handcrafted from over 300 fire-bricks, most cut in halves and quarters and built on a 6000 lb enclosed trailer. The base is a mixed cement pad with vermiculite to help insulate the floor. We used a refractory mortar insulated with three layers of 1” fire blanket insulation. 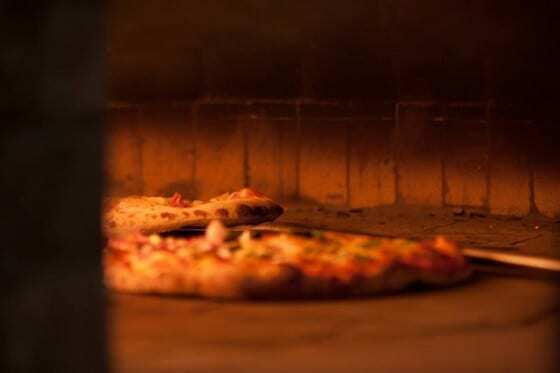 The interior of the oven measures 44 inches and is about the size of a medium commercial grade oven and provides the ability to cook 5 pizzas with ease. We cook our pizza anywhere between 790 to 900 degrees. Temperature of oven depends on temperature outside, humidity, and dryness of wood. We talked with other pizza oven builders and read online articles as well as watched endless YouTube how to videos. What sets the Sourdough Pizza Company apart is the sourdough crust. Sourdough is wild yeast and bacteria fermented without the addition of commercial yeast. 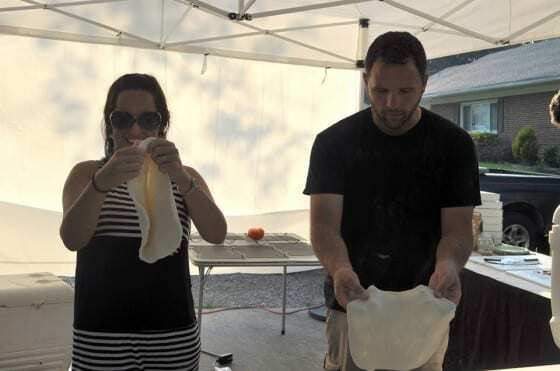 The resulting pizza foundation has a very unique and distinct taste that creates delicious craft pizza. 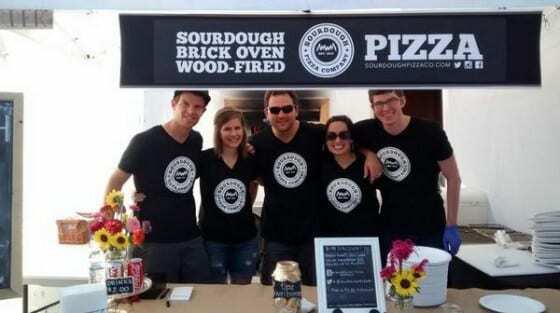 At first the Sourdough Pizza Company started as a backyard endeavor and dream. We hosted countless pizza parties out of the Kolegue’s home and were blown away at the response to our pizza. Time and time again our friends would say that it was the best pizza they had tasted. This served to build an organic following right away and provided confidence for taking the oven to the streets. However, we never want to lose the home-grown feel of our pizza parties which is why most of our business comes from referrals. How have you supplemented the initial backyard parties. What specific marketing tactics have you used to augment growth? One of the biggest things we are trying to invest in right now is brand awareness. We have tried to be very intentional with our marketing and how we are reaching our target audience. For example, at most of our festivals we will run a social media contest. The best photo, comment or interaction (curated by us) wins a sourdough pizza company t-shirt. This encourages interaction on social media and develops brand recognition. Additionally, we get to put a face to the name with our social media followers when the winner claims his/her prize. We also run a discount at any of the festivals we attend that allows customers who follow us on any of our social media accounts to get a discount on their purchase. This helps in two ways. One, every customer loves a discount (happy customer) and two, it builds a following on social media. We’ve also really invested in our branding and appearance. We don’t have a lot of time to attract a potential customer at a festival. That’s why having good branding (logo, colors, signage, etc) that is easy to see is so important to us. Often we’re in a line-up of food vendors so standing out from the crowd is integral to attracting customers. Is there an area that you’ve struggled with that you believe is critical to future success? If so, how are you overcoming that? A big struggle is balancing pizza events with full time jobs. Zac works full time and Megan is a stay-at-home mom to three children. The Sourdough takes a lot of time and effort to produce and balancing full schedules has been a struggle. Fortunately, friends have stepped up to handle certain aspects of the business and help with the various events we cook at. How do you compete with the well known/established chain pizza stores? What about similar mobile brick ovens? For the latter, is there a way to differentiate yourselves if they have a similar brick oven? We never set out with the intention of competing with established pizza chain restaurants. But, our services are unique because we bring the full pizza experience to our customers. The dough is hand tossed and the pizzas are assembled in front of the customer creating a unique visual experience that you can’t get at most chain restaurants. At this time we have only seen one other mobile brick oven pizza company in the area so there is very little direct competition. However, what differentiates us is that we use 100% hand made dough (nothing commercially processed) and our oven is 100% custom, hand-made. When we first started our business we had to start from the ground up. We had no logo, website or even a Facebook page. All of our energy went toward our dough preparation and pizza making. Our close friends, Caleb and Stephanie came alongside us and really started to help us with the business side of things. Our challenges were their specialties. Caleb was able to build our brand identity and help with our image as well as handle all of the marketing. This gave us a social media and web presence that has been integral in building our business. Additionally, our presentation of the Sourdough trailer struggled until Stephanie began working with us. Steph has added a professional, edgy look to Sourdough Pizza Company. Each event we have, she helps our setup looks professional and attractive, whether it’s a fancy wedding or vintage festival! She has a true gift! Caleb and Steph are great contributors in many more ways and especially in the two areas we struggle in. It is another reason we make such a great team! At first thought, I wish we had started a few years earlier. Rather we kicked off our season the same time that Zac switched jobs and I was 8 months pregnant with our third child. I sometimes wonder if this would of been easier before kids and before a demanding career. However, I believe we started this at the time we were supposed to. I believe God has an awesome plan for our business! If you had advice for other SMB owners, pizza company or otherwise, what would it be? Be passionate about your product. Retain your employees. Your employees are your best assets. Even though our business is still run by family and friends, we wouldn’t be anywhere without their help. Don’t lose sight on quality just to save money. Spend the extra dollar to improve your product. Additionally we believe in the relationships we’ve formed over the money that we might make. While we might wow customers with a great product it’s the conversations we’ve had and the people that we’ve met that form a valuable business. In fact, we are trying to support other local small businesses by incorporating their products with ours. For example, buying produce from local farmers and using some of the best local BBQ pulled pork for our pizza! There is plenty of room for us to grow. But, at the end of the day, we want to serve our community the best hand crafted pizza that can be made! We hope to be a business that has happy returning customers and a company that makes our community a better place. We are entering our second full season of cooking and we’re excited to be a consistent vendor in the festival scene. Editor’s Note: Thanks to the Sourdough Team for a fun (and appetizing) interview! While their business and entrepreneurial path wasn’t planned they’ve been able to combine a passion for their product with a need that wasn’t being met in Lynchburgh. There are valuable lessons to be learned in creating a superior and unique product, developing personal relationships that fuel word of mouth marketing, how to market and grow your pizza company (or any small business) on a limited budget and bridging knowledge/skills gaps that are critical to long term success not just for Sourdough Pizza Company but any small business. The beautiful first image (the background pizza shot) in this article is courtesy of Zack Arp-Barnett of Zachary Taylor Photography.